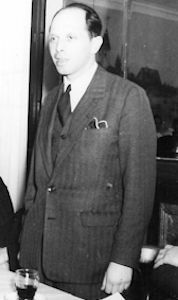 Seventy years ago, on 8 August 1942, the World Jewish Congress representative in Geneva, Gerhart M. Riegner, sent a telegram to British and American diplomats providing them with reliable information about Hitler’s plans to annihilate millions of European Jews. The telegram was the first authoritative word that the Nazis actually had a coordinated extermination plan. Received alarming report about plan being discussed and considered in Führer headquarters to exterminate at one fell swoop all Jews in German-controlled countries comprising three and a half to four million after deportation and concentration in the east thus solving Jewish question once and for all stop campaign planned for autumn methods being discussed including hydrocyanic acid. Riegner urged the US vice consul in Geneva to inform the administration in Washington of the plan and to transmit the contents of the telegram to Stephen Wise, president of the World Jewish Congress and a personal friend of US President Franklin Roosevelt. However, Wise received Riegner’s alarming message only three weeks later, on 28 August 1942. The WJC president immediately relayed it to the US authorities (picture), but the telegram was largely met with disbelief, despite preexisting evidence for mass executions. The US State Department considered it "a wild rumor, fueled by Jewish anxieties", while the British Foreign Office refused to forward the telegram for the time being and called for the allegations to be investigated first. 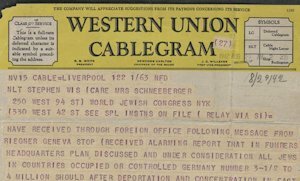 It was only on 25 November 1942 that the State Department contacted WJC President Wise, confirming Riegner's report and granting Wise permission to release the news about the Holocaust to the world. It took a further 14 months until, in January 1944, President Roosevelt created the War Refugee Board whose aim was to try to save Jews. "Since my first telegram, 18 months had passed during which time the inexorable massacre continued and millions of Jews were sacrificed," Riegner wrote in his memoirs. For the rest of his life, Riegner was haunted by the knowledge that many of the six million Jews killed in Nazi concentration camps could have been saved if the United States and Britain had acted promptly on his warning dispatched from Switzerland. "Never did I feel so strongly the sense of abandonment, powerlessness and loneliness as when I sent messages of disaster and horror to the free world, and no one believed me," Riegner recalled in his memoirs. "We discussed it for five or six hours, walking along the lake shore. Did we have to take it seriously? Was it conceivable to kill millions of people? Was it credible?" Riegner agonized. He decided it was. Riegner went on to serve as secretary-general of the World Jewish Congress from 1965 to 1983. French President François Mitterand decorated him with the Legion of Honor in 1987. 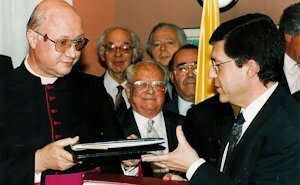 He was closely involved with the often-difficult process of improving relations with the Roman Catholic Church, and was present at the signing of the basic accord normalizing relations between the Holy See and Israel in 1993 (pictured left, in the center; photo (c) Andres Lacko). Riegner was also active at the United Nations, especially in the campaign to rescind the 1975 General Assembly vote that equated Zionism with racism. The resolution was finally annulled in 1991.